Engineering is the design, analysis, and/or construction of works for practical purposes. The Engineers' Council for Professional Development, also known as ECPD, defines Engineering as: "The creative application of scientific principles to design or develop structures, machines, apparatus, or manufacturing processes, or works utilizing them singly or in combination; or to construct or operate the same with full cognizance of their design; or to forecast their behaviour under specific operating conditions; all as respects an intended function, economics of operation and safety to life and property." One who practices engineering is called an engineer, and those licensed to do so have formal designations such as Professional Engineer , Chartered Engineer or Incorporated Engineer. The broad discipline of engineering encompasses a range of specialized subdisciplines that focus on the issues associated with developing a specific kind of product, or using a specific type of technology. The crucial and unique task of the engineer is to identify, understand, and interpret the constraints on a design in order to produce a successful result. It is usually not enough to build a technically successful product; it must also meet further requirements. Constraints may include available resources, physical, imaginative or technical limitations, flexibility for future modifications and additions, and other factors, such as requirements for cost, marketability, producibility, and serviceability. By understanding the constraints, engineers derive specifications for the limits within which a viable object or system may be produced and operated. Engineers use their knowledge of science, mathematics, and appropriate experience to find suitable solutions to a problem. Creating an appropriate mathematical model of a problem allows them to analyze it (sometimes definitively), and to test potential solutions. Usually multiple reasonable solutions exist, so engineers must evaluate the different design choices on their merits and choose the solution that best meets their requirements. Genrich Altshuller, after gathering statistics on a large number of patents, suggested that compromises are at the heart of " low-level" engineering designs, while at a higher level the best design is one which eliminates the core contradiction causing the problem. As with all modern scientific and technological endeavors, computers and software play an increasingly important role. As well as the typical business application software there are a number of computer aided applications ( CAx) specifically for engineering. There are also many tools to support specific engineering tasks such as Computer-aided manufacture (CAM) software to generate CNC machining instructions; Manufacturing Process Management software for production engineering; EDA for printed circuit board (PCB) and circuit schematics for electronic engineers; MRO applications for maintenance management ; and AEC software for civil engineering. 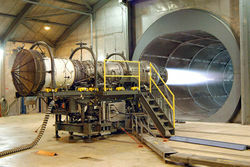 An F-15 Eagle Pratt & Whitney F100 turbofan engine designed by aerospace engineers. The history of the concept of "engineering" stems from the earliest times when man began to make clever inventions, such as the pulley, lever, or wheel, etc. The exact etymology of the word engineer, however, is a person occupationally connected with the study, design, and implementation of engines. The word "engine", derives from the Latin ingenium (c. 1250), meaning "innate quality, especially mental power, hence a clever invention." Hence, an engineer, essentially, is someone who makes useful or practical inventions. From another perspective, a now obsolete meaning of engineer, dating from 1325, is "a constructor of military engines". Engineering was originally divided into military engineering, which included construction of fortifications as well as military engines, and civil engineering, non-military construction of such as bridges. The first steam engine was built in 1698 by mechanical engineer Thomas Savery. Engineers are often respected and ridiculed for their intense beliefs and interests. Perhaps because of their deep understanding of the interconnectedness of many things, engineers such as Governor John H. Sununu, New York City Mayor Michael Bloomberg and Nuclear Physicist Edward Teller, are often driven into politics to "fix things" for the public good. Occasionally, engineers may be recognized by the " Iron Ring"--a stainless steel or iron ring worn on the little (fourth) finger of the dominant hand. This tradition was originally developed in Canada in the Ritual of the Calling of an Engineer as a symbol of pride and obligation for the engineering profession. Some years later this practice was adopted in the United States. Members of the US Order of the Engineer accept this ring as a pledge to uphold the proud history of engineering. A Professional Engineer's name often has the post-nominal letters PE or P.Eng in North America. In much of Europe a professional engineer is denoted by the letters IR, while in the UK and much of the Commonwealth the term Chartered Engineer applies and is denoted by the letters CEng.